Who gets the most done? Who plays well with others? Who cooperates and compromises and forms teams to achieve goals? You might (not) be surprised to learn that in the United States Senate, it's women who do all these things. In new research, analysts at Internet startup Quorum have discovered that on average, female senators work together better than their male counterparts. Now that there are an unprecedented number of women in Congress, analysts say we could be looking at — gasp — more actual legislative activity. There is currently an all-time high of 104 women in Congress: 20 in the Senate and 84 in the House. The "female effect" of increased cooperation, as The New York Times calls it, is present throughout Congress, though it is noticeably stronger in the Senate. This might be attributable to the fact that female senators historically get together for dinner — all 20 women had dinner with President Obama last year. According to Quorum, over the last seven years, the average female senator has co-sponsored 6.29 bills with another female senator, while the average man has only co-sponsored 4.07 bills with a male peer. Though the women in the Senate are overwhelmingly Democrats — 14 out of 20; only six are Republicans — Quorum's data also shows that women work with each other across party lines to pass bills. Over the past seven years, the average female senator (though these women are anything but average) has co-sponsored 3.79 bills with each woman from across the aisle, while the average male senator has done so with only 2.16 bills from each man of the opposite party. Female members of the House also work together more than their male peers do — they each co-sponsored 2.85 bills with another woman on average, while men did so on only 1.67 bills. According to Quorum, this data is "highly significant below the .0001 level." That means if you're telling anyone about these findings and they counter that the data are probably not statistically significant, you can be sure that they are. And on the whole, women just do more — they introduce more bills than men do, and they get more cosponsors. How many more bills do women introduce? Quorum's co-founder Alex Wirth told The New York Times, "Women are not only introducing more legislation over the last seven years, but they are also getting more support for that legislation, getting more bills out of committee and getting more enacted than their male colleagues in the U.S. Senate." On average, each female senator produces 26 more original bills than her male peer. Not only do women's bills come into the Senate with more frequency, but they are actually enacted more often. 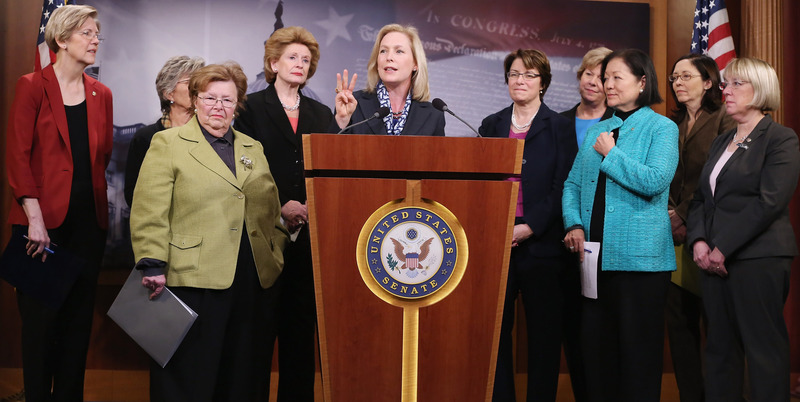 Evidently, "women are doing something really, really right" in Congress, even as a minority. But we can't write off their increased productivity as a result of just being a woman. That's a flimsy excuse, and it's just as sexist to say that all women are friendly and cooperative as it is to say they're all rude and mean. So if it's not their gender, what is behind the undeniably high numbers backing up women's excellence in Congress? One possibility is that the women who are elected to office may be more motivated than their male counterparts because they need to be if they're going to make it into the boys' club. This is plausible, but it's not quite satisfying, and it doesn't help male senators become any better at being senators. As Quorum's blog post about their data hints, the reason for cooperation and successful compromise among women is likely due to the fact that they hang out outside of work — strictly off the record. Female senators get together once a month to eat and chat about matters both work-related and not. Senator Barbara Mikulski (D-Maryland) organizes the dinners. She told CNN they forge a "zone of civility" among the women. "When the day's over, let's kick back and put our lipstick on and have a glass of wine, and keep the institution and America going," Mikulski said. Sounds like a plan.